Access to Internet offers education, communication and knowledge to everyone with a dial-up. The Internet creates the possibility for anyone, regardless of class, gender or citizenship, to publish a selfie or get a degree. But the freedom the net initially offered is getting more restricted and controlled by the biggest multinational corporations. Massive amounts of user data is collected by both corporations and governments and are used in ways unknown to citizens. Based on readings, news and experiments this project is a creative exploration of data collection in the age of internet and how to use Industrial design for creating awareness of the digital footprints we leave behind while participating in our modern society. 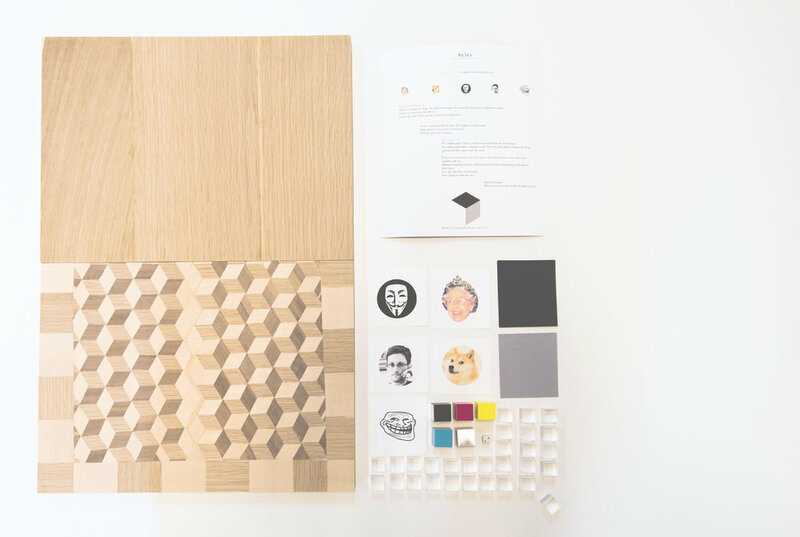 The dark playground is a analog boardgame about surfing the digital world. they interact with information on the net. Companies use data to better target their market. By running data through analyzing tools it is also possible to predict analytics for investment. Not only that, but companies can also sell meta data about their users to other companies. Collecting and analyzing data can bea benefit for society, for example when investigating criminal activities. Public healthcare in Sweden have been helped by data when mapping the spreading of diseases by monitoring what symptoms people are googling. It is easy to imagine that data collection on a large sale could be of help, by providing basis for research when developing the community and make infrastructure and public transport more effective. Abstract concepts such famine or giant plastic islands on the middle of the ocean are difficult to grasp when not confronted directly. The issue of data collection is in comparison even more abstract since the consequences are not as visible or as newsworthy. Humans are short-sighted. Our brains have been evolved in an environment where threats come sudden - with a fight or flight behaviour as a response. There has been no need for humans to take note of problems that develop slowly. And of course it is depressing to read bad news that get worse. It is easier to turn our attention to other daily activities, such as family, friends or work. Daily activities that to an extent is conducted online in some ways, thus reinforcing the behaviour. Daily behaviour that is difficult to place in an environmental context. When logging into Facebook or sending an email from Gmail, how many people are actually thinking of the data that is being collected? The question is, in this cases of multinational companies, governments and Internet, is there any legitimacy to getting a bit paranoid? And operation names such as PRISM - collect it all and X-KEYSCORE, that could have been borrowed from a dystopian sci-fi about the end of the world, are not helping to ease this paranoia. With these names the consignor is literally begging for a dark interpretation of the intent behind. If you are concerned about the players of the net hold getting hold over your data and paranoia is creeping up on you, would it help to disconnect and take a lifetime hiatus to a secluded spot on Greenland? Probably not. Facebook have the technology to map and collect data from people without them even ever joining the site. Research shows that a computer program can draw accurate conclusions about a person just by mapping data about the person’s contacts instead and therefore getting the data it needs to plot unregistered users. Facebook have also been proved to track non-Facebook users’ browser activity for two years after visiting a Facebook page. News articles also describe how Google’s browser Chrome have been secretly put audio recording software on computers that run the browser, meaning that Google can listen in on activities going on in the room where the computer with chrome is located.